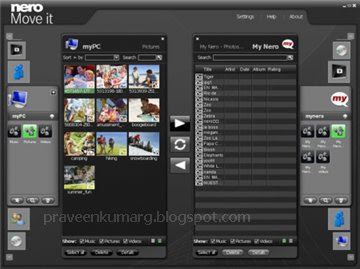 Supports all types of formats for music, videos, and photos, Nero Move it lets you enjoy all your multimedia files on the most popular portable and mobile devices, with free updates to others as they become available. Access your files quickly and hassle-free from any source including your PC, digital camera, portable devices, and from online communities, and easily transfer them to iPodÂ®, iPhoneâ„¢, PSPÂ® and other mobile devices or online communities. Listen to your favorite songs stored on your iPodÂ® or your mobile phone. Transfer your pictures to online communities, such as My Nero, YouTubeâ„¢, and MySpace with just a few clicks. 1. Digital Life is Better Shared!